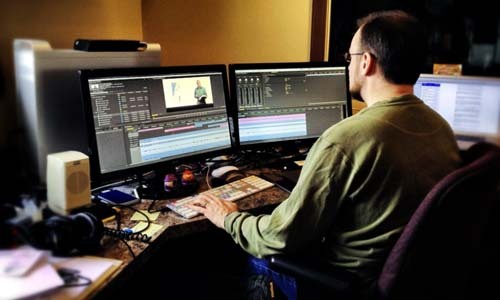 One of the main tasks involved in editing videos is compiling different clips of footage and joining them together to create the ‘final cut’. The manner in which your videos are joined (i.e. cut) together and the way in which one clip transitions to the next will affect the flow of the video and how smooth it appears to be. Both the L and J cuts can help make videos with conversation flow much more smoothly by staggering the transition between the video and the audio. With the L cut you’d cut the video from one clip to the next first but keep playing the first clip’s audio before transitioning to the second clip’s a while later. The J cut works in reverse and you’d cut the audio first, and then the video later. When cutting a conversation this will allow reaction shots to be interspersed into the video without affecting the flow of the audio. Arguably one of the smoothest ways to cut a video is with the cut on action. It requires that you cut from a clip where an action is being performed, and to a clip where that same action continues. The idea behind this cut is that the viewers’ attention will be focused on the action that the transition itself will go unnoticed and won’t appear jarring at all. The ‘action’ that exists in both clips can sometimes be implied, such as a shot of someone pushing a door can be cut to a shot of the door opening from the other side. Cutaways are transitions that cut to a clip that is not part of the main scene or subject. While they are normally used to add context to a scene, they can also be inserted into jump cuts to make them less jarring. Jump cuts that cut from and to the same clip at a later point are one of the most jarring and least smooth types of cuts – which is why they should be used only in specific cases. To help mask them, cutaways can be inserted in between so that the video continues to look smooth. The best way to see the impact of the types of cuts listed above is to try them out in practice when you cut video. That can be done with any video editor software, and for example, you could try Movavi Video Editor. Although the ‘flow’ and ‘smoothness’ of the video are relatively subjective, the manner in which you cut the video will definitely have a big part to play in both of them. At the end of the day, your goal should be to cut videos in such a way that they don’t jar viewers too much or distract them from the video’s content.